Welcome to Nerdy Boy Productions LLC. Learn more about us right here. Nerdy Boy Productions LLC started as a passion, a passion for Music. Music is our lives and we needed a vehicle to be able to share our passion with others. What better way than through a Mobile DJ Service? What started out as a small dance driven venture has boomed into a full-blown Production, DJ, Installation, and Consulting Company and just recently we added Professional Audio-Video and Lighting Equipment Retailer to our list. Whether you are planning a small Birthday Party, a Prom, a Wedding, a Corporate Meeting or Concert. Call Us! Need a Sound or Lighting System Installed in a Meeting Room, Sanctuary, or Commercial Space? Call Us! Looking to purchase Audio, Video or Lighting Equipment, Cables or Connectors? Call Us! Nerdy Boy Productions LLC are Retailers for several Major Audio, Video, Lighting and Production Accessory Companies. At Nerdy Boy Productions LLC, we pride ourselves in the fact that we not only provide an Affordable Professional Service, but also have left every event with Abundantly Satisfied Customers. Ask for References! With Nerdy Boy Productions LLC you are in the best hands, period! Our goal is to make your Event a Great Experience for you, our customer. 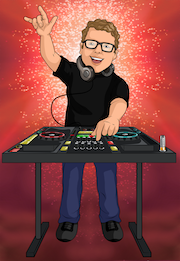 Your event is important to us, which is why we offer nothing but a First Quality Mobile DJ service. Along with the atmosphere we create with our "State of the Art" digital production equipment our DJ's know how to get a show "Popping" and the crowd up and "Dancing". We have over 15 years experience! Large or Small, if you want your next event to be a success go with Nerdy Boy Productions LLC. Alex Mclemore (AKA) DJ Nerdy Boy is the owner and operator of Nerdy Boy Productions LLC. Alex has over 15 years' experience in live sound and lighting production as well as 6 years in mobile DJ production. I love Indie Music, Pop, Hip-Hop (both new and old school), Dubstep, Trap Step, House and the Oldies or anything with a great beat or tempo to get you moving, so for your next event have full confidence knowing that it will be a great one, with Nerdy Boy Productions LLC on the scene.